At the beach and in the city, this polo fits all styles of clothing. Ruckfield Rugby Polo very casual for summer with its message "Rugby à la plage" (rugby on the beach) on the chest and embroidery on the back with palm trees. 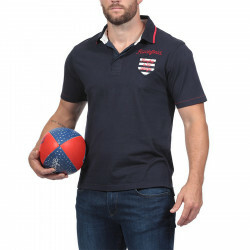 This Jersey cotton polo shirt can be worn with coloured chino trousers. Short-sleeved navy blue polo shirt with a straight cut. Coat of arms on the chest and "Rugby à la Plage" on the back in red. Spiked collar, lapel collar and half-placket contrasting with palm-print fabric. Slots listed.